Doorhangers. They do get your attention. We used to make them for church in advance of the first service of the church "year" in September and go around in the neighborhood hanging them on front doors. I'm not sure it was the most effective advertising but it was inexpensive. They died out for awhile, but have seen a resurgence of late. I get now, on the average, one a week. It's also a job for people to walk the streets leaving this bit of paper and a plastic bag affixed to the front door. I came home last night to find another one. This was different however. Huh? Well, this is something new. I seem to remember "Bandz" from years ago. Do kids still collect these? It must not have cost a lot of money to include these in a plastic bag that has a better than average chance of being chucked immediately in the waste bin. I'm not like most people. 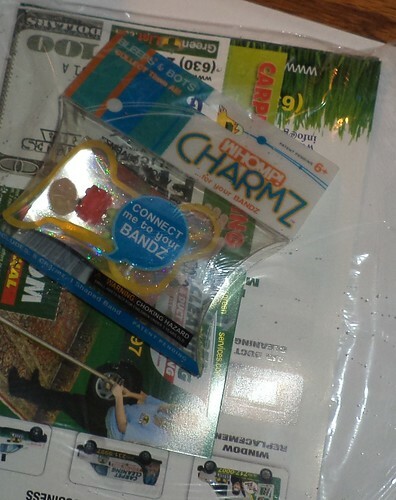 I separated the component parts, recycled the paper flyer, put the plastic bag in recycled bags and set the "Charmz" aside. I think I'll just toss this in the give away bag unless one of my readers really, seriously, declares a lust for it. Ten words or less, "Why I should send this to you." Extra points if you write that in poetry. Next two weeks, until November 20th.